Bentley was a marvelous technician and with his light touch and superb penwork he gave a lyrical whimsy to his work that was the perefct compliment to the humor contained within. Bentley (14 June 1907 – 14 August 1978) was a British author and illustrator famous for his humorous cartoon drawings in books and magazines in the 1930s and 1940s. He was born in Highgate the son of Edmund Clerihew Bentley (the inventor of the clerihewverse form); he was born with the name Nicholas but opted to change the spelling. He married Barbara Hastings (1908–1989), a writer of children’s books and the daughter of Sir Patrick Gardiner Hastings on 17 October 1934, and they had one child, Arabella in 1943. Bentley was educated at University College School where he left at the age of 17, having decided that his academic abilities would not take him to university. He then enrolled at Heatherley’s School of Fine Art, a prestigious private college, but left after a few months. After leaving Heatherley’s, Bentley worked without pay as a clown in a circus; when this job ended he was a film extra, and during the General Strike of 1926 he worked on the London Underground. It was at this time that Bentley sold his first drawing to his godfather, G. K. Chesterton. He had a commission to draw illustrations for a trade newspaper called Man and his clothes in 1928, and his first regular job as an illustrator was in the publicity department of Shell. Bentley worked for Shell for three years but disliked working in advertising. In 1930, Hilaire Belloc (who was a friend of his father) invited him to illustrate his book New Cautionary Tales. The good critical reception of this book and its illustrations allowed him to go freelance. During the 1930s Bentley illustrated works ranging from J. B. Morton to Damon Runyon. His most famous drawings were to illustrate T. S. Eliot‘s Old Possum’s Book of Practical Cats, but he illustrated more than 70 books in the course of a long career. 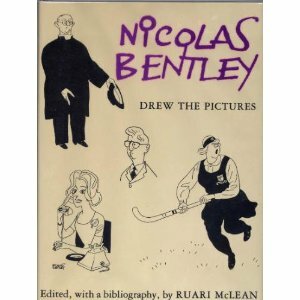 He customarily used the byline “Nicolas Bentley drew the pictures”. His favourite illustration work was for his own books and he considered himself primarily an author. One of his best-known books, Ready Refusals, or, The White Liar’s Engagement Book gives a quotation for every day of the year drawn from a surprisingly wide range of sources together with an appropriate illustration. He also wrote and illustrated Golden Sovereigns – and some of lesser value – from Boadicea to Elizabeth II (1970), a humorous book about the English monarchy. Bentley had enrolled as an auxiliary fireman in 1938 and served in the London Fire Brigade during World War II. He illustrated How to be an Alien (1946) by George Mikes. After the war he took a few regular cartooning jobs including on Time and Tide (1952–54) and drawing pocket cartoons for the Daily Mail from 1958. He gave this job up in 1962, complaining that it put too much strain on him. In later life he was the illustrator for Auberon Waugh‘s Diary in Private Eye and contributed other cartoons to the magazine. He moved to Downhead, near Shepton Mallet in Somerset. He died on 14 August 1978 in the Royal United Hospital, Bath, Somerset.